It’s been a really long time since I made stir fry of any sorts, and this skirt steak stir fry really hit the spot. I remember trying a stir fry variation a while back, but it was only okay. I think it’s because it was missing the salty flavor of soy sauce, tamari or coconut aminos. Soy sauce and tamari are both out for me because of the wheat and soy, and I avoided coconut aminos up until recently because they’re considered questionable on the SCD. Since I’m 1-1/2 years in on my healing process, I thought I’d give the coconut aminos a shot. Lucky for me, I had no problems. I used to cook with coconut aminos prior to eating SCD/paleo, because I learned a long time ago that wheat/gluten was not okay for me. Needless to say, I’m happy to have a bottle back in my refrigerator. This recipe is flexible in the sense that you can use any protein or veggies that you like. I definitely recommend trying it with the skirt steak though. It works great for stir fry and cooks up quickly because of its thin nature. Plus, it’s oh so flavorful. I think I’ve said this before, but it’s one of my favorite cuts of beef. This is great served with chopped raw cashews and/or green onion, and with an extra drizzle of coconut aminos. I’m not a sesame seed fan, but that would work well as a garnish too. Melt coconut oil in a large skillet over medium heat. Add the garlic and celery, and saute about 1 minute. Then add the skirt steak strips and season with a little sea salt and pepper. Continue to saute for a couple minutes. Then, add the carrots, broccoli and mushrooms. Add the coconut aminos, rice vinegar, chicken broth and red pepper flakes. Continue to cook over medium-low heat. Meanwhile, heat a small skillet over medium heat. Add a little coconut oil to the pan and once melted, add the beaten eggs. Allow to cook for a few minutes. Once it starts to set, lift the edges of the omelet with a spatula to allow some of the egg liquid to get underneath. When the omelet is stable enough, flip and allow to cook an additional minute. Remove from pan and place on cutting board to cool. Add the water chestnuts to the stir fry and stir. Turn heat down to low. Slice the cooled omelet into strips, then chop into small pieces. Add to the stir fry. Once everything is heated through and veggies are softened, but still slightly crisp, remove from heat. 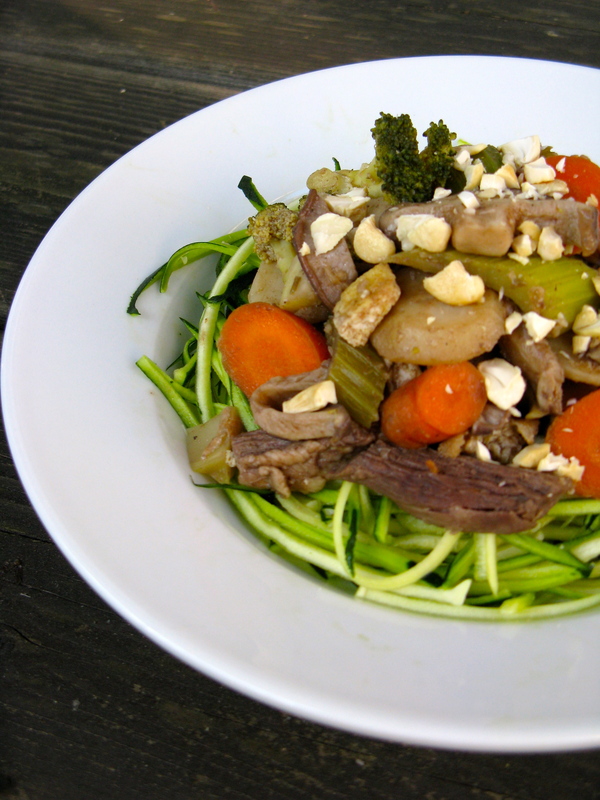 Serve over cauliflower rice or zucchini noodles (use a julienne peeler to make noodles). If desired, you can mix the cauliflower rice or zucchini noodles into the stir fry and then serve. Top with garnishes of choice and extra coconut aminos, if desired. sounds amazing!! So glad coconut aminos agree with you 🙂 that stuff amps ups dishes a ton!! i loooove it!